TALLAHASSEE (Florida Record) — A bill that would reinstate non-economic damages caps on all personal injury cases, previously struck down as unconstitutional by what one lawmaker called an "activist" Florida Supreme Court, is headed into a hearing before a State House committee Tuesday. Florida State House Bill 17, which would place a $1 million cap on civil pain and suffering damage awards, is scheduled for hearing before the House Judiciary Committee. The bill, which also would revise plaintiffs' compensation for medical treatments for injuries cause by another party's negligence, was referred Judiciary after first read in Commerce Committee early last week. Late last month, the bill, introduced into the House on Feb. 20, passed a Commerce Committee by a vote of 13-7. Earlier in March, the bill passed the Civil Justice Committee 10-5. The bill marks one of the latest efforts by state lawmakers to address non-economic damages caps that were previously declared unconstitutional. Early in the summer of 2017, the Florida Supreme Court issued a split 4-3 decision in North Broward Hospital District v. Kalitan declaring Florida’s medical malpractice damages caps personal injury cases to be unconstitutional. That ruling rejected a change to those caps approved about 14 years earlier by the state Legislature and then-Gov. Jeb Bush and found "non-economic" damages in those caps violated constitutional equal protection rights and "arbitrarily reduce damage awards for plaintiffs who suffer the most drastic injuries." HB 17's sponsor, State Rep. Tom Leek (R-Ormond Beach), did not respond to Florida Record requests for comment but he apparently told The Daytona Beach News-Journal last month that the 2014 and 2017 Supreme Court was "wrong" in its decisions and isn't the Supreme Court that Florida has now. "What we saw there was probably an activist court," Leek, an attorney with Daytona Beach insurance firm Foundation Risk Partners, was quoted in the Daytona Beach news report. "We have a new court now." 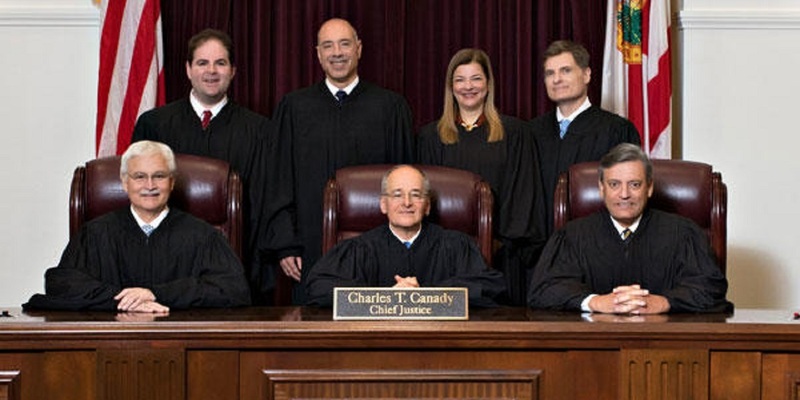 Appointments of Justices Barbara Lagoa, Robert Luck and Carlos Muñiz to Florida's highest court by Republican Gov. Ron DeSantis has made it "the most conservative Florida Supreme Court in decades." In addition to addressing civil pain and suffering damage awards caps, a previous version of HB 17 would have taken on product liability. The bill, as then envisioned, would have shielded Florida businesses from liability. However, the provision reportedly was removed over concerns it might impede Florida's ongoing litigation against opioid manufacturers. HB 17 also follows a report from the American Tort Reform Association, which ranked Florida as the second worst "judicial hellhole" in the U.S., behind California and ahead of New York. ATRA, in its ranking for Florida, refers to a "storm of unsound decisions" by the state's Supreme Court "that have further damaged the state's civil justice system" and says Florida "also suffers from a severe lack of legislative reforms." ATRA also cites a Perryman Group finding that excessive tort costs in Florida result in $7.6 billion in annual direct costs and a loss of 126,139 jobs in the state's economy "when dynamic effects are considered."